Yesterday was not the best time to be on the Internet, because of April Fools’ Day. A lot of pranks made the rounds that left some fans laughing, and others furious. But let’s be fair- if there’s someone that should be queen of April Fools, it’s Maisie Williams. 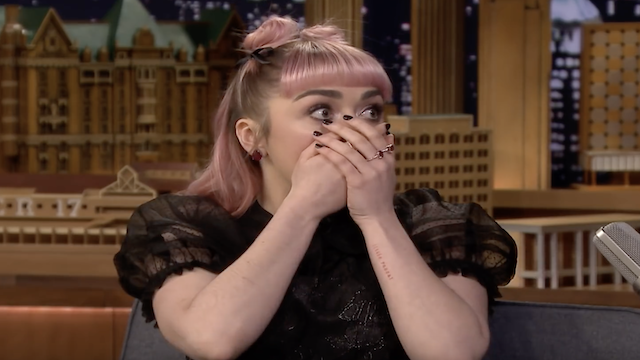 The star of Game of Thrones just pulled off a great prank during The Tonight Show With Jimmy Fallon yesterday. On it, she seemingly lets a huge spoiler for the final season leak- but the last laugh is on them. The interview, which is below, starts out innocently. Fallon asks Williams about her five favorite moments from the series. “There are so many,” she says. “But in terms of things that really defined (Arya Stark),” she mentioned a few examples. These include her father’s beheading in season one, which “spiraled her whole arc.” She also brought up ditching her original costume and her time with the Hound. But then things get interesting when Fallon asks for any kind of spoiler. She explained that HBO sent out a lot of memos to avoid giving these away. Fallon, however, continues to pry. And here’s where the joke gets good. Williams says that during the final days of shooting, she notes that Arya “dies in the second episode.” And just a second after saying that, she emits a look of shock on her face and covers her mouth. The audience buys into it, with a few gasps for good measure. She then immediately asks Fallon if the show is live and wants an edit. He assures her that they can get that done and jumps back into the interview. She then storms off set, and he goes after her seconds later to see if she’s okay. But then Fallon pulls the curtain and both of them yell, “APRIL FOOLS!” Indeed, it was all planned. A lot of Twitter users praised Williams and Fallon for the prank, though others were a little bitter. Alas, we’ll see what actually unfolds with Arya Stark and company when Game of Thrones’ final season debuts April 14 on HBO. What do you think of Maisie Williams’ April Fools Day prank? Let us know in the comment section below!